The kit combines enzymatic fragmentation with end-repair and A-tailing in one reaction to create a highly efficient first step in library generation, which is followed by ligation and PCR (optional for PCR-free workflows). This effective one-tube workflow produces DNA-seq libraries with consistent library size, high yield, low GC-bias, and high coverage. The kit includes all the required reagents for fragmentation, library prep, and magnetic bead-based cleanup, and it is compatible with your NEXTFLEX® barcodes of choice. This DNA-seq library prep kit is highly flexible in terms of sample requirements, accommodating a range of sample types and sample input amounts from 1 ng to 1 µg to quickly and efficiently generate high-quality libraries for Illumina®sequencing. The NEXTFLEX® Rapid XP DNA-Seq kit contains enough library prep reagents and cleanup beads to prepare 48 DNA samples for Illumina® sequencing. The shelf life of all reagents is at least 6 months when stored properly. The Nuclease-free Water and Resuspension Buffer can be stored at room temperature. The NEXTFLEX® Cleanup Beads XP should be stored at 4°C, and all other components should be stored at -20°C. The NEXTFLEX® Cleanup beads XP ships at room temperature, while other components ship on dry ice. The kit simplifies workflow by using master mixed reagents and magnetic bead based cleanup, reducing pipetting and eliminating time-consuming steps in library preparation. 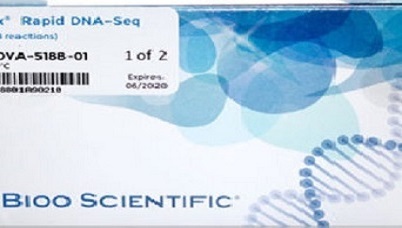 The NEXTFLEX® rapid DNA-seq kit produces library preps with a larger number of unique sequencing reads, allowing for robust genome coverage in challenging GC-rich sequences that can introduce bias. 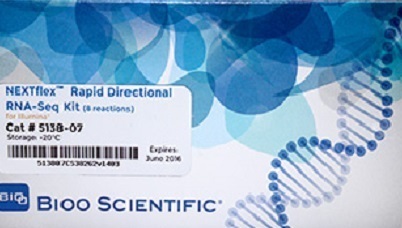 The kit bundle includes unique NEXTFLEX-HT™ barcodes for the number of reactions (8, 48, or 96 reaction size kits) in a single-use format. This allows the lab to tie all the necessary components of the library prep workflow to a single lot for ease of purchasing and tracking of consumables. The NEXTFLEX® DNA-seq 2.0 kit bundle contain library prep reagents, including cleanup beads, to prepare 8, 48, or 96 genomic DNA samples. 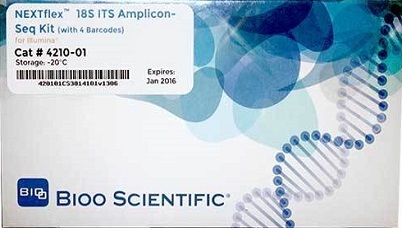 The bundled solution also includes the corresponding number of unique NEXTFLEX-HT™ barcodes per reaction. The shelf life of all reagents is 6 months when stored properly at -20°C. This kit is shipped on dry ice.